Does Travel Insurance Help in Egypt? The short answer is, “Probably not as much as you’d like.” A typical bundled cancelation/interruption/delay policy is likely to cover some small stuff but not the big. A few companies apparently do better: Travel Insured International and Travelex are at least partially covering cancelations to a limited degree. Specific coverage varies by individual policy. The companies that focus on medical evacuation (medevac) rather than cancelation are apparently helping some Americans get out of Egypt. However, unless travelers previously bought specific “political evacuation coverage,” they must pay for any assistance they receive. And policies that do include “political evacuation” are generally out of the mainstream of ordinary consumer travel insurance. Ordinary medevac insurance covers evacuation only in the case of accident or sickness. Again, civil unrest doesn’t count. You’ve probably seen reports that the Canadian, U.S., and other governments are operating some evacuation flights – and charging very stiff fees for the service. As far as I can tell, standard travel insurance will not cover these fees. Travelers on package tours may fare a bit better. The US Tour operators Association (USTOA) reported that its member operators have succeeded in getting all of their travelers out of Egypt. But USTOA members are generally the biggest and most reliable. I have no information about how well the smaller operators are doing. This is a good time to remind you that most travel insurance is about the money, not the trip. That means the insurance covers only what you can’t first get back from suppliers you’ve already paid. Airlines are generally allowing rebooking or full refunds without fees for travelers who have already bought tickets to Egypt. Policies vary, however. On “nonrefundable” tickets, some lines may offer only rebooking within a specific date range rather than open-ended rebooking or refunds. Check your airline for specifics. According to USTOA, member companies are canceling Egyptian trips and offering clients some combination of rebooking and refunds. In any such cases, travel insurance would cover only the amounts that airlines, tour operators, and hotels do not refund. In many cases, that means no payout at all. Two of the big online travel insurance websites are posting and updating the latest developments in insurance coverage. Probably the best is the blog posted by Squaremouth, but Insure MyTrip‘s posting is also highly informative. Keep checking these sites if you’re at all interested in travel to the region. Surprisingly, several of the other sites I checked have nothing specific to say. Delta is the only big U.S. line with its own flights to Cairo, and it has canceled flights through March 27. You can either rebook or get a refund. Codeshare partner Air France/KLM apparently is still operating at least some Cairo flights. If you’re flight is canceled or “significantly delayed,” you can get either a full refund or rebooking. As far as I can tell, foreign airlines and tour operators are still operating in and out of the big resort of Sharm-el-Sheikh. No riots, therefore business as usual. For some time now, I’ve been recommending that if you need travel insurance, your best bet is a “cancel for any reason” policy. Otherwise, you can all too easily get involved in a controversy about what is and is not listed as a “covered” reason – and insurance companies often win those arguments. If you decide – as in this case – that you just don’t want to travel anywhere in the Middle East for a while, you can cancel any trips you have planned with no questions asked. Just make sure to cancel at least 48 hours before departure. 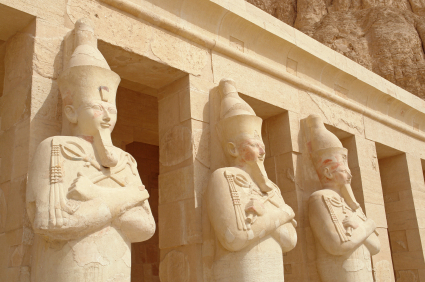 Has the unrest in Egypt caused you to change your travel plans? Tell us about it by adding a comment below!